Startups are tough….. Here’s a simple equation to get you headed in the right direction. Blood – Like an initiation to a gang, founders basically cut their hand and make their pledge to build a successful company. No Blood, No Commitment. Sweat – A massive work ethic and a JFDI attitude will be required to break down all barriers and knock down all doors along the way. Better bring your gloves, water bottle and a sweat towel. 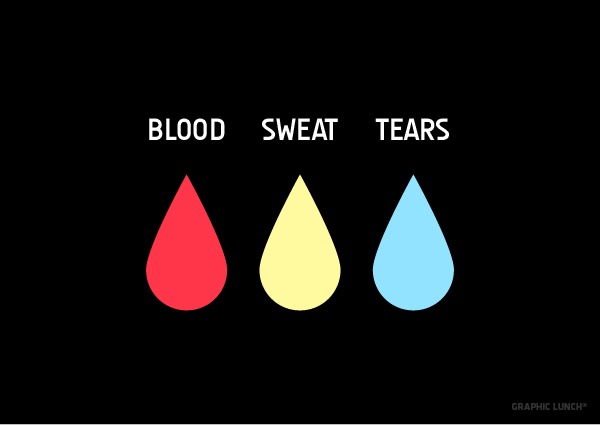 Tears – You will feel pain. You will cry. It’s ok. A better way to think about it is if you haven’t cried because of your startup experience you are on the road to nowhere. Comfort doesn’t equal success. Code – Something needs to be built and someone needs to code it. Piecing together other services or just pulling API’s is not defensible long term. Figure out what you – and only you – can create and then protect the IP. Once you build the secret sauce you can outsource all other technical needs of the product. Polish – Design is quickly becoming the great differentiator between the good, the bad and the ugly of technology. User experience, or how the end user interfaces and understands your product, should be your number one focus. If a user doesn’t enjoy using your product why should they tell their friend to use it? Sales -Plain and simple, customers pay the bills. A startup’s need for sales and marketing talent is still undervalued in today’s technical heavy Silicon Valley. Minus a large investment, your startup will wither on the vine if no revenue is ever generated. And if VC’s ever do invest they will want to see revenues, so either way sales and marketing are a core function of startup success. Luck – Perhaps the most important of all is luck, which unfortunately is out of the hands of the founders. But the saying goes “you make your own luck” so being in the right place, at the right time, in the right market, talking to the right people and releasing the right product all can be influenced by the founders. The more chances you take the more lucky you get so get out there and get discovered. dailydeal.de bought back by founders from google – second change in the “daily deal” market after the 95% down-round of Living(death)social yesterday. I came to Silicon Valley with my co-founder just 10 months ago with a prototype and a goal to succeed. In this short timeframe, we’ve been rejected in an Y Combinator interview, then raised from angels and venture capitalists after 6 months of trying and launched the product. We got acquired in month 10.